Here I just did lots of layers with some card stock I hadn't used for awhile, and of course had forgotten about. I know none of you ever have that happen. For the image and greeting I used first Versamark and then In The Navy Inks and then heat embossed with clear. That technique works so well. I'm trying really hard to finish the inside at the same time I'm making the card. Sure does make life easier when I have to send it out. So that's it for me today. I might have more time later to play some more, but it's time for dinner. Thanks for stopping by, I adore your comments! I saw this cute thang on Pinterest and just HAD to try making him. I'm sorry I don't know where I saw it now, so I can't give anyone credit. As you can see, he's just made with some circles and a little triangle for his nose. Doesn't he look happy? So glad you stopped by, I adore your comments. The weekend is close, hope it's a good one for you. This is the last of the cards that I needed to put on my blog. I really love this one. Lots of sponging. I used the stamp set from Kitchen Sink called Multi-Step Pine Trees. This is just a lovely set, with 3 different size trees. The dimension on the final image is amazing. And here's a tip I learned from Frenchie Martin. Take a dark brown marker and color in the trunk of the tree here and there, as I have done here. It makes the trees so much more real. On this card I stamped the largest image using all 4 stamps on a piece of white card. Then I masked the tree and sponged in the sun using a circle mask. After I was done sponging I took the 2nd step stamp for the medium sized tree and only stamped with that. I love the delicate image you get with just the one stamp. Then I stamped the greeting with the Kitchen Sink 3-Step Baseball Stamp Set on vellum and white heat embossed it. So now I'm done for the day, hope you had a good one. Thanks for stopping by, I adore your comments!! Still doing a little housekeeping. This is another card I made some time ago for a challenge I hosted over at the Mod Squad Challenge. This is a multi-step set called Baseball. I love all the dimension in that bat!! One of the best features of this stamp company is that there are color recipes for most of the multi-step stamps, so you don't have to guess what colors to use. And there are even alternative colors if you don't have the inks that are suggested. Have I told you how much I love Kitchen Sink Stamps?? They are the most fun, and the results are amazing. Go check them out!!! Oh, and thanks for stopping by! This is a card I made some time ago for a challenge I hosted over at the Mod Squad Challenge. I'm just now getting around to posting it on my blog. I used a great stamp from Kitchen Sink Stamps. Their stamps are amazing, and many of them are multi-step, so you can get real dimension. This is a closeup of that beautiful stamp. The stamp I chose is the set called Mother's Cameo. This is a multi-step stamp consisting of 5 different elements. I chose Lavender and Lace as the challenge because the stamp reminds me of my 93-year old mom who loves lavender. Thanks for stopping by, I adore your comments. Hope you are staying warm....or cool, as the case may be. I know my friends in the Southern Hemisphere were complaining about how hot it was. I can't imagine that....ha ha. Hope those of you who have experienced the wrath of Ma Nature over the last days are beginning to see an end to the madness. Here in Northern Michigan we didn't get any storms, so I count myself lucky. Usually it's we who are blessed with the white stuff. I have been fortunate, as of late, to be working with the wonderful folks over at Kitchen Sink Stamps. Maria, owner and designer, is over the top talented. If you are not familiar with these amazing stamps, you need to check them out. Many of them are multi-step, so you get a lot of dimension. I wanted to make these cute dolls look like the real Russian nesting dolls. I colored them with my Copics and then got out my white gel pen and designed a pattern. Lots of die cuts and embossing folders used here too. I die cut 3 different button shapes, stacked them together, and covered them with UTEE for a nice shine. I can't wait to use this stamp set again and try some other patterns on the dolls. So thanks for stopping by, I adore your comments. And don't forget to hop over to Kitchen Sink Stamps and see what they have to offer. You won't be sorry!! This week over at Mod Squad, Vicki Dutcher and I are the hosts. If you haven't ever played along with this challenge, now's your chance. There are amazing sponsors, and prizes every week. Click HERE see. With Valentine's Day just around the corner, we thought it would be fun to make a Valentine's Day card. You have license to make anything you please, but keep Valentine's Day in mind. This way you will have at least one done!!! And if you don't really celebrate Valentine's Day, just include a HEART or the word LOVE somewhere on your card. Easy peasy. Kitchen Sink Stamps offers us a discount CODE: ModSquad15. These stamps are amazing. Most have a multi-stamp feature that lets you get great detail in your images using several colors. There is real dimension with a 3-D effect! And one of the best features of this stamp company is that there are color recipes for most of the multi-step stamps, so you don't have to guess what colors to use. There are even alternative colors if you don't have the inks that are suggested. 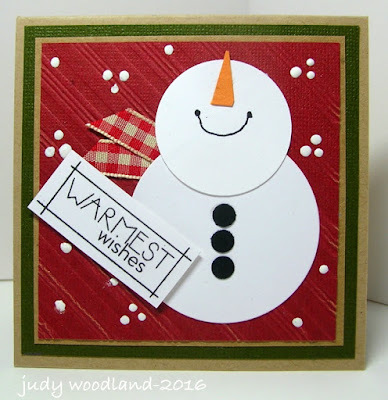 Maria from Kitchen Sink Stamps is a member of our Mod Squad Challenge Facebook Group so feel free to say Hi or ask any questions. $25 GIFT CERTIFICATE to the store. You can pick your own goodies and there are lots of choices! 3 Step Daisy. This set has 3 different daisy flowers, plus a cute little lady bug, and some fantastic sayings as well. It is a 3-step stamp, so you really get a lot of dimension. Thanks for stopping by. And if you have a little free time, swing on over to Mod Squad and play along. Stay warm, my friends! I adore your comments. Holy COW is it blowy and snowy out. It's been snowing off and on for the past 4-5 days. Expressways are closed because of accidents....I'm staying in!!! Oh, and just a side note, gas was down to $.87 yesterday here in Northern Michigan. WHAT??????? Today's card has been made for the Mod Squad Challenge. My BFF Donna Phelan is the host this week and her challenge is to make a friendship card. She is over-the-top talented. Go check out her BLOG and you will see what I mean. I think this little image is so stinkin' cute. I don't know the name of the stamp set because it came with my stamp magazine as a free gift. He was so much fun to color with my Zigs. I stamped him on watercolor paper. Today's offering is for the Mod Squad Challenge, to do the ombre technique. My dear friends Barb Campbell and Lesley Turner are hosting this week, and they are beyond talented. Click on their names to visit their blogs and see what I mean. I chose to do a study in blue today. My ombre is on the background. I sponged 3 colors - Danube Blue, Faded Jeans, and Tumbled Glass, and then ran the piece through an embossing folder. The flourish die cut is from a Spellbinders die, and the background scribble, done in GKD Turquoise Sea, is cut with a die from a Sizzix set called Scribbles and Splatter by Tim Holtz. This set is new and I love it!! Here is a close up of the scribble......I think it's so fun!!! The little flowers were punched out in Powder Blue card stock and sponged with Danube Blue Ink, then attached to the flourish die cut. Little pearls are added to the middle. Thanks for stopping by, I adore your comments. Hope you all have a good weekend, I'm enjoying some time to myself again after the crazy December I had. Whew - maybe we can finally get back to normal. The holidays are over, and winter has set in. The Princes were here for a few days, but are back home and back to school. Now what??? Haha! Yeah, it's weird, right? So, I got some time to play! I wanted to enter the Mod Squad Challenge this week, because my good friend Kathy Krug is the host. Her cards are amazing, check them out on her blog HERE. Her challenge is Anything Goes Using at Least One Die. She is the die cut QUEEN I tell ya!!! Go look at her work if you don't believe me. I love the greeting. It's from a Paper Wishes stamp set called Simply Susan. Lots of Zentangle-like images, and this wonderful greeting. It was so nice to just make a card that wasn't Christmas-y or winter-y, or fall-like. I just heard the house pop and our thermometer says 2 degrees (shiver). Hope you all are staying warm. Thanks for stopping by, I adore your comments. Kraftin' Kimmie April Release Hop! I'm 12 Days of Christmas Royalty! !